SaintFrancisDam.com HS7074 | St. Francis Dam Disaster | Coroner's Jury Inspects Dam Site, March 1928. 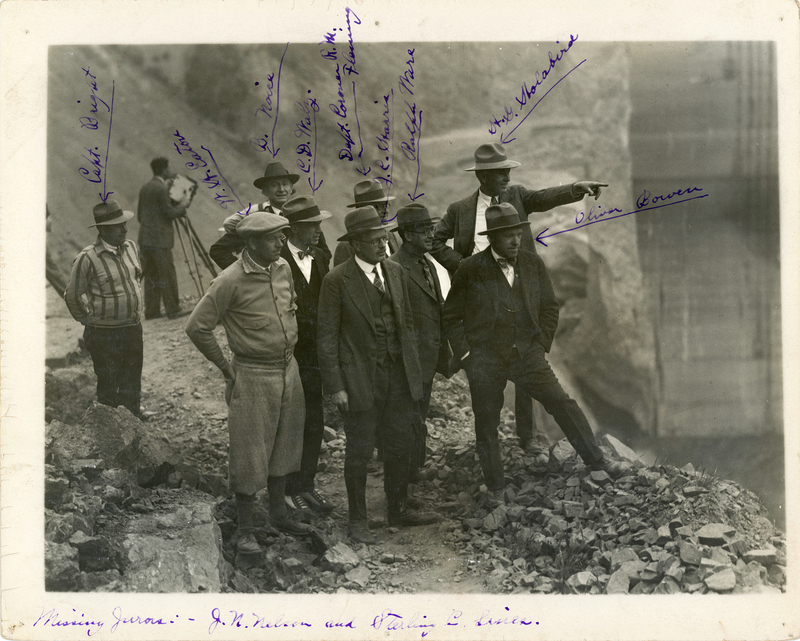 Friday, March 23, 1928 — Members of the coroner's jury are strangely all smiles as they inspect the St. Francis Dam site in San Francisquito Canyon. From left: Capt. William J. Bright, chief of the Sheriff's homicide squad (not a juror), William H. Eaton, Blaine Noice, Chester D. Walz, R.M. 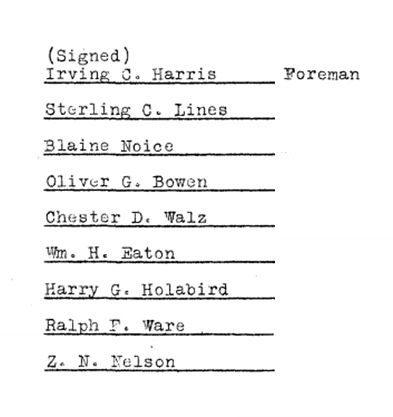 Fleming from the coroner's office (not a juror), Irving C. Harris (jury foreman), Ralph F. Ware, Harry G. Holabird, Oliver G. Bowen. Not pictured (evidently not in attendance): Z.N. Nelson, Sterling C. Lines. Los Angeles County Coroner Frank A. Nance empaneled the jury March 19, 1928, one week after the fatal flood. The inquest began March 21 and continued until final testimony was taken April 10. The verdict was rendered two days later. Specimens from Dam Site to be Studied by Jurors. United Press | As published in Santa Ana Sunday Register | March 25, 1928. 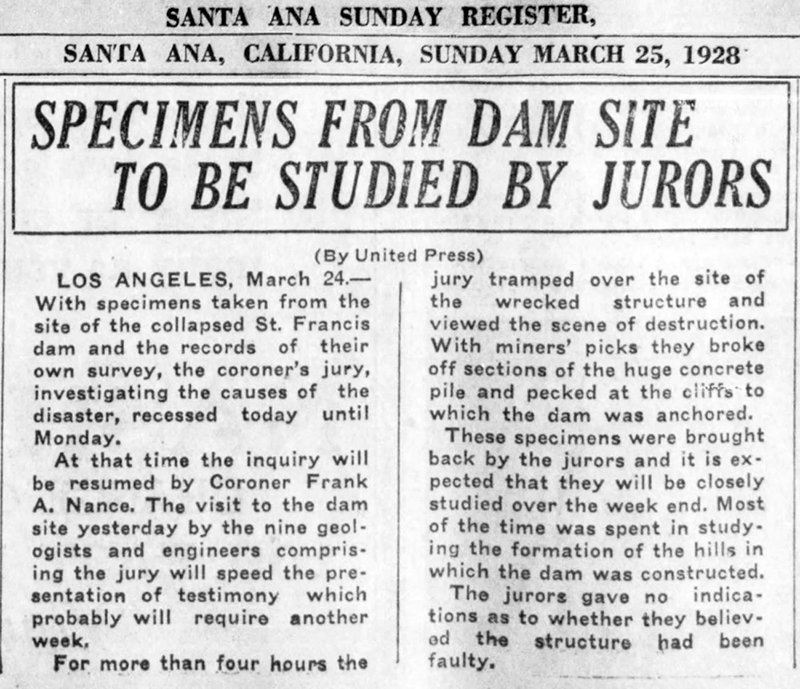 Los Angeles, March 24 — With specimens taken from the site of the collapsed St. Francis dam and the records of their own survey, the coroner's jury, investigating the causes of the disaster, recessed today until Monday. At that time the inquiry will be resumed by Coroner Frank A. Nance. The visit to the dam site yesterday by the nine geologists and engineers comprising the jury will speed the presentation of testimony which probably will require another week. For more than four hours the jury tramped over the site of the wrecked structure and viewed the scene of destruction. With miners' picks they broke off sections of the huge concrete pile and pecked at the cliffs to which the dam was anchored. These specimens were brought back by the jurors and it is expected that they will be closely studied over the week end. Most of the time was spent in studying the formation of the hills in which the dam was constructed. The jurors gave no indications as to whether they believed the structure had been faulty. HS7074: 9600 dpi jpeg from original photograph in SCV Historical Society collection. Stamped imprint on back indicates it was donated by Thomas E. McNeill of Valencia.